Deenfest Promotions presents THIS IS COLOUR's Aberdeen date of their Scottish January jaunt. The boys from Bury St.Edmunds, Suffolk are signed to THIRTY DAYS OF NIGHT RECORDS and recently released their debut album 'NO BRAINER'. local support comes from UNCALM, with their new five man line up, DEAD END and GRADER will also be causing trouble after releasing a split EP together. 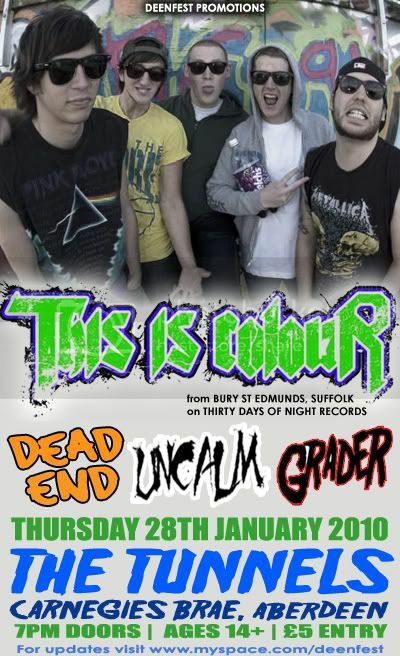 all kicks off at The Tunnels on Thursday 28th January. doors at 7pm, ages 14+ and only 5 entry. what time are this is colour meant to be on? messaged twice, still the title has not been corrected for me. note: Uncalm ARE playing this. and with new five member line up, yas! Anyway better late than never, I have now changed it. It was me who approved it originally, pretty certain I didn't change anything then though.